recommended for: Fans of Tamora Pierce, Throne of Glass by Sarah J. Maas, dystopian fiction, and old-school dragons and adventure. DARKSOULS Ana has always been the only one. Asunder. Apart. But after Templedark, when many residents of Heart were lost forever, some hold Ana responsible for the darksouls–and the newsouls who may be born in their place. SHADOWS Many are afraid of Ana’s presence, a constant reminder of unstoppable changes and the unknown. When sylph begin behaving differently toward her and people turn violent, Ana must learn to stand up not only for herself but for those who cannot stand up for themselves. LOVE Ana was told that nosouls can’t love. But newsouls? More than anything, she wants to live and love as an equal among the citizens of Heart, but even when Sam professes his deepest feelings, it seems impossible to overcome a lifetime of rejection. Asunder is a worthy sequel with its own charms, perhaps even better than its predecessor. We return to a Heart riddled with signs of civil unrest, full of new mysteries and challenges. I read Asunder so close to Infinite that I must remind myself where the division was, because so much happened in this book. Rather than being overwhelmed, I was excited. The stakes were higher on every count. There's the mystery of Templedark to deal with; the prejudice against new newsouls; the outcry against Ana's and Sam's romance; the secrets of Ana's past. Here, Ana really becomes her own person--not just a trainee, but a young woman strong and capable enough to fight her own battles. I also found answers to many of the questions raised in Incarnate, and am still reeling from Meadows' cleverness and originality. This sequel is breakneck to the shocking end, a perfect middle that doesn't suffer from the "filler" feelings of some 2nd books. It's stands on its own. I wanted answers after Incarnate, and I got them--only they weren't what I expected, in the best way. Meadows shows just how masterfully she crafted the first book with its forehadowing and secrets by pulling it all together in this book. Discovery is a huge theme here, with much of the plot revolving around Ana working out the mysteries she discovered during Templedark. I won't spoil, but the answers reveal a depth of worldbuilding rarely seen in young adult fantasy. And that wasn't all. Each page is a careful thread in the tapestry of this plot, all building to a startling conclusion. When Ana isn't mining for the secrets of Templedark, she's protecting young newsouls, confronting sylph, testing Sam's inhibitions, campaigning for the rights of her people, or being threatened and attacked by oldsouls resentful of their New brethren. There's also a nice twist on a love triangle that seems realistic rather than infuriating. By the time I caught my breath, I was using it to beg for the final installment. The issues presented in Incarnate gain depth and prominence here. Meadows deals with a huge number of issues without it seeming chaotic or overwhelming. Death, prejudice, religion, love, loss, growing up. The tragedy of Templedark has sparked feelings of loss and grief in those who lost loved ones, and fear in those who envision it happening to them. Before, Ana was one newsoul, feared because of her uniqueness but gaining acceptance. Now, there are those who see her as a harbinger of doom, who see the possibility of more newsouls as a death sentence for themselves and their whole culture. The effects of fear and uncertainty, and what desperate people will do, become central to this book in a way that carries through beyond the last page. Ana and Sam were the main players in book one, but some of the lovely side characters find their own voices here. Stef, the clever engineer, becomes vastly important. We're shown her sweet side and her dark side, which comes to a head in the final chapters. Then we meet Cris, grower of purple roses, a quietly complex character I adored from his first page. I would have liked Sarit to be more prominent in book 1 before being called Ana's best friend here, but Meadows does a decent job of making up for Sarit's limited introduction. In this book, she's more present and also shows a playful side to Ana. We also get way more of Meuric and other baddies; again, I would have liked more introduction to them earlier, but I was excited to see them here, though some of them could have been more complex. So hard to describe without spoiling! Suffice to say, clashes between characters are so crucial to this plot. Of course I can't forget Ana and Sam. 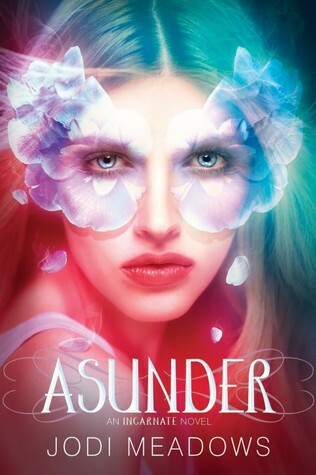 I loved Ana in book 1, but in Asunder is where she began to shine as her own person. Some of the fear and timidness has worn off, allowing her to make a place for herself as her own person. I enjoyed watching her struggle between her love for the oldsouls and her empathy for the newsouls, leading her to become champion and protector of those like herself. Some people complained about this, but I enjoyed her musings on love and whether she was capable of it. She experienced such torture with her mother that I would think it unrealistic for her not to struggle with her worth as loved and lover. Sam became deeper too, more lively and more complex with his battle between being proper and following his heart. In learning more of his origins and past relationships, I found some of the vulnerability in him that was more shadowed in book 1. The only thing that annoyed me? Ana got kind of preachy. I understand her motivations, but I still wanted to punch her in the face. I think Meadows really comes into her own in this book. Some people suffer from sophomore slump; she just shows her growing maturity as a writer here. The lyrical quality of Incarnate is still intact, but everything is even tighter and more polished than before. She also has a much stronger grasp of the voices of every character, not only Ana. Asunder proves that she is far from a one-hit-wonder. The pacing was phenomenal for a book with so many threads. Everything happens at the right time. It lulls at the right time, races at the right time. What I couldn't stand was the excessive use of "asunder." A title word or key word should be sprinkled carefully. It's power comes from being unexpected, rare. It felt like Meadows was just throwing it in sometimes to hammer home the main message--and she hammered the nail until it fell through the wood. It's not enough that I didn't love the book, but by the end, I was getting angry claw hands. A stunning sequel that takes fantasy and romance to new heights, leaving the reader breathless and dying for more. I agree with you about the use of Asunder by the way - too much! Mind you, there is loads of quotable stuff in there though! Can't wait for Infinite, the cover is so gorgeous! Ha, I'm glad I wasn't the only nitpicky one. Naturally it wasn't enough to keep me from reading it. I had so many dogears of great quotes! Oh god, I can't wait for you to read Infinite. I just reviewed it and I'm absolutely certain you'll love it.